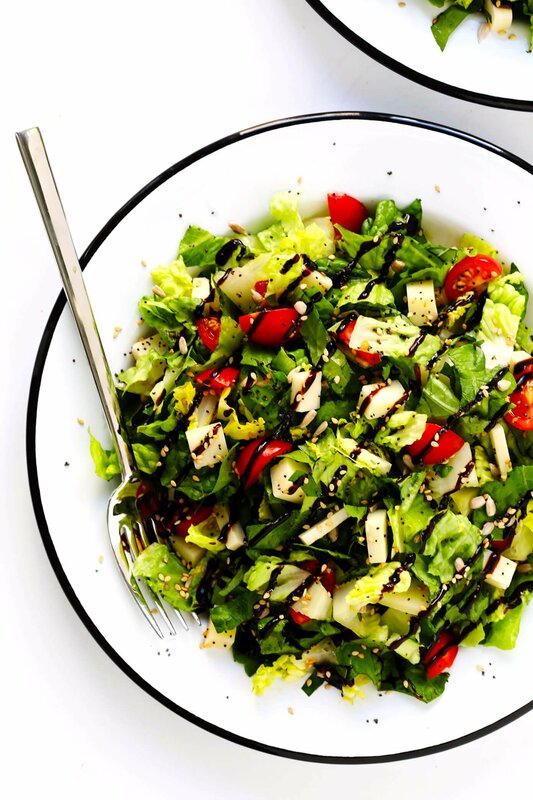 This unforgettable Italian Chopped Salad is full of fresh tomatoes, basil, Romaine, Pecorino, a rich balsamic glaze…and “sprinkled” with some surprise ingredients! Ever since we returned home from our trip to Rome, I have been itching to recreate this salad we tried on our very last day there at a cute restaurant called La Prosciutteria. Tons of you had actually recommended that we check out this place, thanks to their infamous design-your-own-cheeseboard menu — which was just as brilliant and magical as you would imagine. But surprisingly, the surprise dish that swept in and stole the show ended up being this gorgeous side salad! We added it to our order at the very last second, feeling the need for something green to balance out all of those delicious meats and cheeses. But after a few bites, we ended up wishing we had a cheeseboard-sized platter of salad too. It was ridiculously delicious. And also — can I say — a little ridiculously random? On the menu, it sounded like it was just going to be a simple, caprese-ish green salad, full of fresh tomatoes (mmm, those tomatoes in Italy are next-level), Pecorino cheese, fresh basil, and Romaine, drizzled with a thick balsamic glaze. But when it arrived, we took a closer look and saw that it was sprinkled with a variety of “confetti”, including lots of sunflower seeds, poppy seeds, toasted sesame seeds and black pepper. Basically, everything bagel seasoning! Which is definitely not something I typically associate with Italian food. But hey, those Italians know what they’re doing. And this was absolute perfection. The other good news? 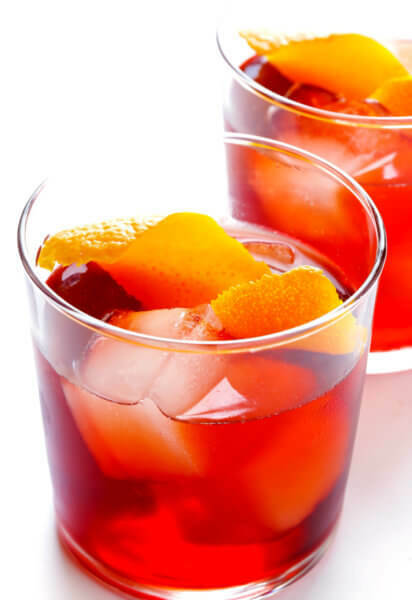 This one is super-easy to make. Just chop up a large head of Romaine (or whatever greens you have on hand), a pint of cherry tomatoes (hopefully they’re nice and ripe! ), and lots of fresh basil (we agreed the more, the merrier). Then if you can get your hands on a big hunk of Pecorino cheese, that is unquestionably the best way to go here with all of its aged, salty, goodness. But — that said — Asiago, Manchego, Mozzarella, Provolone, or even a mild Parmesan would work well here too. 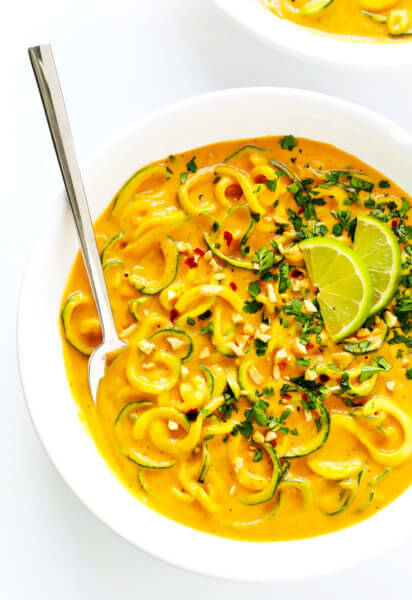 Drizzle everything with a generous pour of good-quality olive oil and a little lemon juice, and toss to combine. 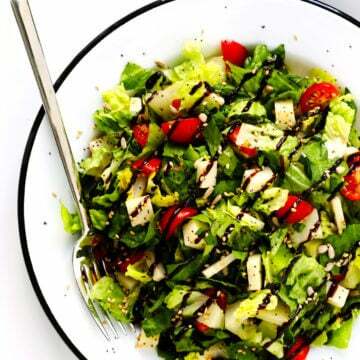 …and drizzle with some balsamic glaze, and maybe a few extra pinches of seeds and voila! Seriously, this one was an unforgettable part of our trip, so hope you enjoy it too! And look out — this trip was wildly, deliciously inspirational — so more Roman recipes to come! 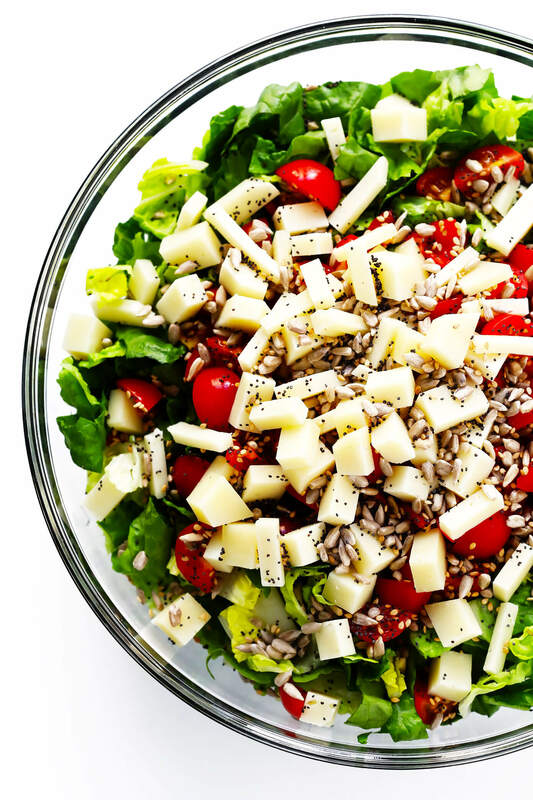 Combine Romaine, tomatoes, cheese, basil, and sunflower seeds in a large mixing bowl. Drizzle evenly with lemon juice and olive oil, then toss to combine. Sprinkle evenly with the everything bagel seasoning and a few generous pinches of salt and pepper, and toss to combine once more. 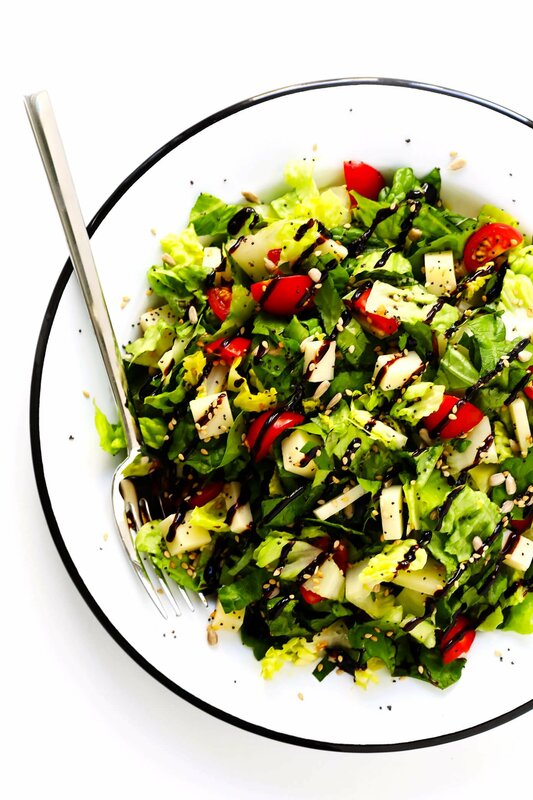 Serve immediately, drizzled with a generous pour of balsamic glaze. 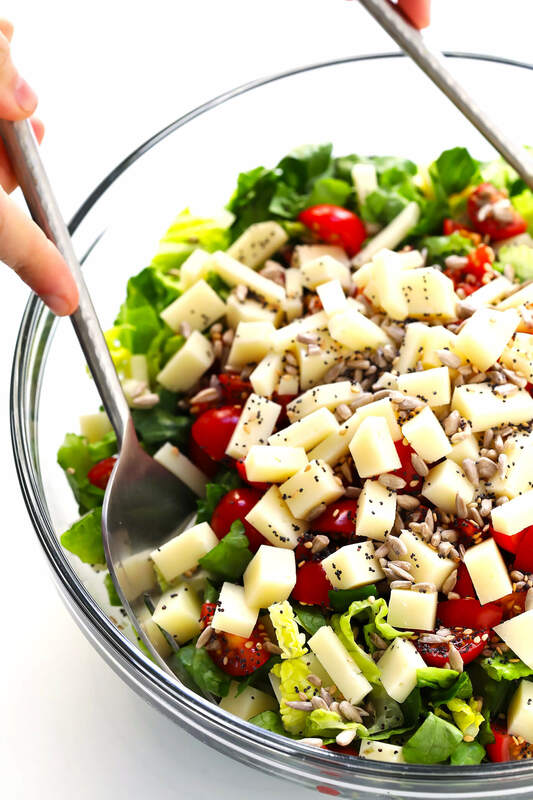 *Some substitutes for Pecorino cheese could include Asiago, Manchego, Mozzarella, Provolone, or even a mild Parmesan. In my opinion, an aged/salty cheese works best here. Can’t wait to try this…been waiting since I saw it on your Instagram. I bought that glaze months ago – then couldn’t remember what to do with it. Thanks for reminder! Living in Rome myself, I credit the freshness and excellent quality of Italian produce . Most coming from local markets and grown 0 kilometers. Italy takes big steps to protect it’s “Made in Italy” and as Nr 1 on the world foody scene. Everytime I return to the US, it’s a very distinctive difference in the flavor of Romaine lettuce. Flavorless compared to Italy’s. I love a good salad! I cannot wait to try this recipe. It looks so delicious. I never even would have thought to use the bagel seasoning. 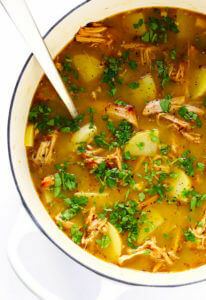 Easy to make and went great with my Tuscano Chicken and Pasta! I am thinking it may have had a touch of pumpkin seed oil in it, w/a tiny bit of sweetner? I will try it w/this & see. Thank you. I am doing an Easter Brunch & this may be one of my stars. This was delicious! So many yummy flavors together… I used baby San Marzano tomatoes & shredded the Pecorino on the large side of my cheese grater. Really loved it, will definitely make again!! This salad really does look lovely! Already put it on my to-do list. I just noticed that the nutritional information doesn’t work anymore – this was the case with every recipe I checked. I hope you are not planning to get rid of it entirely. This salad is delicious! Also very quick and easy to make, even with homemade everything spice and balsamic glaze. Thank you for a recipe that I will definitely make again. Really really delicious. Thank you. I used a Havarti cheese and it was great. What a great salad! The “Everything Bagel” seasoning really made for a pleasantly surprising flavor – don’t leave out the balsamic glaze!!! Perfect salad for a hot, Arizona, summer day! Very refreshing, yet filling salad. Another hit! We really liked this recipe. Not average salad flavors and very easy to put together. It will definitely be making a comeback. This salad was absolutely delicious! I used Asiago cheese in 1/4” cubes but did not have basil. The lemon and olive oil when mixed with the balsamic drizzle was heavenly!!! Then the everything bagel seasoning put it over the top. I did not add extra salt or pepper because the bagel seasoning and salted sunflower seeds providedenough salt. Excellent! Can’t wait to make it again!!! My family loved this salad and so did my friends! I even made the everything bagel seasoning using the linked recipe. Then, my daughter told me you can actually buy it at the store. It was simple to make and really enhanced the flavor of the salad.